If you’ve ever craned your neck back in awe of Chicago’s stunning skyline, it won’t come as a surprise to hear that the winds of change are sweeping into the Windy City. Thanks to several key factors, a recent boom in commercial real estate in Chicago suggests that the future is bright for anyone who’s invested in that famous skyline. In a national climate of economic uncertainty and fiscal irresponsibility, it’s easy to wonder what Chicago has done to encourage this real estate boom. Astoundingly, Chicago’s commercial vacancies were lower in 2015 than they had been in a seven-year period. With out-of-state entities grabbing up available office space as well as foreign interests staking their claims, Chicago’s growth is turning heads and raising eyebrows. How will all this growth change the face of Chicago? What infrastructure or benefits does Chicago have to offer developers over other cities? Most importantly, is all this growth sustainable? Thanks to the rich pool of talent that covers the spectrum of business and culture, a flood of interest in Chicago office space has ignited the real estate market. In large part, a huge driving force of these changes is a reflection of the millennial mindset. Chicago is desirable – not only to the younger generation, but also to international entrepreneurs. While visitors to Chicago are often awed by its sleek, ultramodern vibe, the truth is that those seeking their pot of gold at the end of the Chicago rainbow are looking for a place bursting with creative potential. That’s why major companies are looking at refurbishing their existing spaces to compete for the cream of the talent pools who, in large measure, seek more than a blank wall and a bit of fresh air only going to and from the parking area. For some companies, this means adding open-aired spaces on rooftops or courtyards where tenants or employees can avail themselves of the creative blessings of fresh air and living plants. For other companies, digital security and credentialing systems are being added or improved upon to entice high-profile talent ready to catapult company brands to the next level. For those on the outside looking in, the rapid-fire pace of innovation in Chicago real estate these days means that to look away is to miss something important. Even a single decade has powerfully altered the face of “Paris on the Prairie,” and the renovations even stretch to the ivy-covered walls of Wrigley Field. What Makes Chicago So Appealing? While many people love the city simply for its skyline, a closer look reveals that there’s much more to love than bright lights and great pizza. Chicago’s greatest asset is her people. Because of the incredible depth of talent as well as the abundant marketing opportunities, many suburban businesses are opening satellite office spaces in Chicago . Other larger foreign entities are opting to move their headquarters to locales closer to their markets, and Chicago office space fits the bill perfectly. Is All The Chicago Commercial Real Estate Growth Sustainable? In a world where much emphasis is placed on immediate returns with little thought of future dividends, it appears that – in keeping with its history of measured, planned success – Chicago’s plan for growth is designed to last. For one thing, Chicago’s infrastructure is and has been built around effective, efficient transportation. Because a majority of Millennials, who are at the fore of the tech-savvy talent explosion – prefer availing themselves of mixed-use transportation rather than automobiles, the focus on transportation infrastructure is a foresight than is likely to pay off for years to come. Experts say that current trends show no sign of stopping in the near future. With inventory in short supply and prices high, it’s a great time to be in the real estate business in Chicago. Thanks to the many forward-thinking programs designed to sustain this growth as well as the plethora of culture and entertainment opportunities, it looks as though, for Millennials, Chicago may be the perfect place to put down roots for a lifetime. At the same time, many long time residents of Chicago aren’t completely enthused about the rampant growth. Especially in areas like Chicago’s Old Town neighborhood, elaborate plans for vaunting structures is intimidating to those who find the lowrise appeal jeopardized by eager developers. 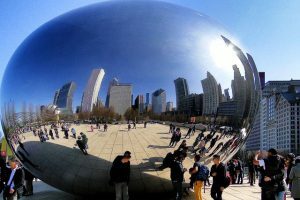 As new blood moves into Chicagoland, the dynamic between native Chicago residents and newcomers will largely determine exactly how sustainable, if not peaceful, the real estate boom will prove to be. Although it has an impressive history, Chicago’s main appeal for new investors is its vibrant flexibility and creativity. Attractive to graphic arts designers seeking the best platform to market their abilities to sell lunch meat or promoters looking to draw better crowds to Wrigley, it doesn’t take long to understand that it’s all about the energy. Even if the Cubbies don’t pull through again this year.